The 2001-2007 Toyota Sequoia and 2003-2006 Toyota Tundra with JBL systems are known to have problems with the front door speakers. Some customers have also reported rattle from the rear doors but after fixing the front doors the rattle in the rear goes away. Today we will cover how to address the rattling front speakers in your Toyota Tundra or Sequoia. After you learn how expensive the factory Toyota / JBL replacement speakers cost you might consider going with a cheap, aftermarket speaker. This would be a bad idea however for a couple of reasons. First of all, the speakers are powered by a factory amp. Normally if you swap the speakers you also have to consider changing the amp or head unit. This adds extra cost so you are no longer saving any money. Secondly, it's almost impossible to find anything that will fit in the front doors of the Tundra or Sequoia. The JBL speakers are a unique 7" size and the left and right speakers have mirrored bolt patterns. This means you can't use a left door speaker in the right door because the bolts won't line up. That's why the left and right speakers have different part numbers. The drivers (left) side is the 86160-AF070 and the passengers (right) side is the 86160-AF060. Instead of overpaying at the dealership or modifying your vehicle with an inferior aftermarket speaker we suggest fixing the old ones! The problem with the speakers is the outer foam suspension separates from the metal basket. At first glance it might appear intact but by pressing the edge down around the frame you'll notice the separation. This is caused by dry rot and is the reason why your speakers rattle. 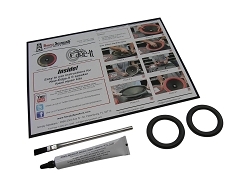 Simply Speakers has an easy to install DIY kit available to fix both front door speakers. We also have a complete tutorial of how it's done on YouTube. Within a a few hours you can have your speakers fixed and save several hundred dollars in the process. Remember this kit is for the Toyota Tundra and Sequoia with the JBL system. If you have a non JBL system in your Toyota we can still help. Please contact us directly for more info.